Rockweed is harvested in Iceland's cole, clean waters. Rockweed powder contains about 1/3 of the iodine Kelp powder has. 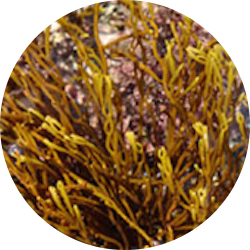 Similar to other sea vegetables, Rockweed's full spectrum of minerals and trace elements are beneficial for alkalizing our bodies. Rockweed Powder is generally used in super shakes and smoothies, tea and supplements since the whole leaf version usually has an unusual smell and slightly bitter flavor when cooked. And our Rockweed Leaves are geo-thermal dried so they are a totally RAW living superfood!